The annual Les Francofolies summer music festival, held in Spa, Belgium, promotes francophone music and attracts hundreds of thousands of fans over a five-day span. 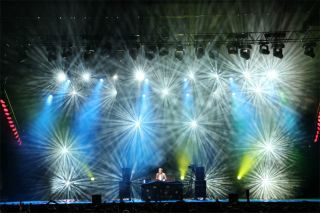 ARTO, a Brussels-based production company, handled the festival’s production and lighting design, which consisted exclusively of HARMAN’s Martin Professional lighting fixtures. As an integral part of the system ARTO deployed 28 Martin MAC Viper Profile moving head fixtures, in addition to several other Martin luminaires. The MAC Viper Profile is a high-output profile luminaire that offers light quality, a diverse feature set and a highly optical system. With its 1000-watt HID source, the Viper consumes less power, making it over 50% more efficient than its 1200-watt rivals. Housed in a slender and agile body, the Viper’s responsiveness and fast pan/tilt speeds have led it to become a favorite among designers. In addition, the main stage design also included 26 MAC 2000 XB Wash lights, 24 MAC Aura LED moving heads, and 8 Atomic 3000 strobe light fixtures. The MAC 2000 Wash lights offered a combination of power and color mixing that Mathieu said would not have been possible with other fixtures. The multi-function and zoom capabilities of the MAC Auras, paired with the robust color and power savings, were an asset to the live show especially during the daylight.